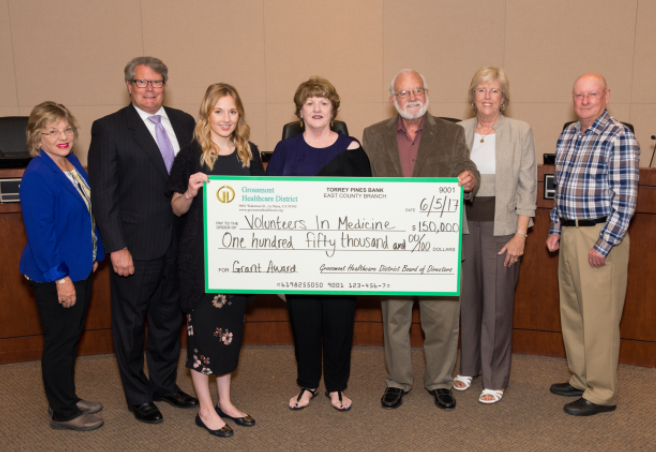 The Grossmont Healthcare District (GHD) recently hosted a check presentation ceremony with Maureen Hartin, CEO of Volunteers in Medicine (VIM) San Diego. The ceremony celebrated GHD’s ongoing support of VIM, including a $150,000 grant awarded during GHD’s current fiscal year. GHD’s grant will assist with paying for diagnostic test lab tests and fees as well as medical supplies for uninsured residents in the East Region, who are treated for free at the VIM El Cajon medical clinic at 1457 East Madison Ave.